CTR Enhancer JS – Tool for advertising publishers Created by DAEXT. This templates have specific characteristics, namely: CTR Enhancer is also available as a WordPress Plugin, check out the CTR Enhancer WP official page here in . 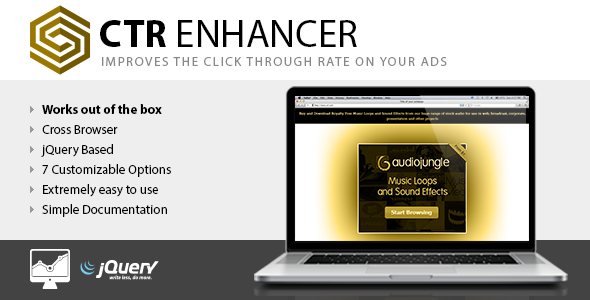 CTR Enhancer is also available as a WordPress Plugin, check out the CTR Enhancer WP official page here in CodeCanyon. Improve the click through rate on your banner ads by up to 200% with this simple but effective script. First of all, CTR Enhancer works with jQuery, you have to include the jQuery library before using this plugin in your website. CTR Enhancer is very easy to use, simply wrap your ad code in a div with the “ctr-enhancer” class. CTR Enhancer includes 7 customization options.